Thursday - Small HMOs vs. "Super HMOs"
This content has been provided by experienced HMO landlords from the Platinum Property Partners community who have generously shared their knowledge and tips for a happy HMO life! Join us ALL THIS week for a cracking "HMO Week" 2017 - everything you could want to know about HMOs and more! To learn even more about HMOs, join the HMO Group on Facebook, which is an excellent resource for HMO landlords. PPP provide a tried and tested business model to help you set up and develop your own specialist buy-to-let property portfolio. They help you generate exceptional levels of lifelong income as well as capital growth. Their model helps you to maximise the returns and minimise the risks of investing in homes of multiple occupancy (HMOs) for young professionals. Using your growing portfolio to fund further property investments. 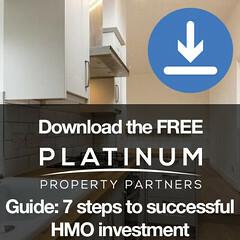 Property Tribes is pleased to bring you our first ever "HMO Week". It's powered by Platinum Property Partners. The PPP model is based on high quality HMOs let to young professional tenants, although some landlords opt for lower quality properties let to tenants in receipt of housing benefit. "HMO Week 2017" runs from today for the next 7 days, and new and exclusive content will be added daily. The week takes you on a journey - from sourcing an HMO, to getting it set up compliantly, to marketing, to management and all stops inbetween.